Makuta, Inc. President, Stu Kaplan, was featured in the November-December issue of the EMERGE newsletter. A joint program of the Rose-Hulman Institute of Technology, Blue River Career Programs and Shelby County Development Corp., EMERGE is designed to build interest in STEM (Science, Technology, Engineering, Mathematics) learning and career opportunities. Kaplan made presentations on micro molding at 5 county high schools plus the ITM Robotics Academy to support this important program. To read the full article click here. Sumitomo (SHI) Demag Plastics Machinery opened its display at MD&M Minneapolis today with a high-precision micro molding demonstration featuring a production mold from Makuta, Inc. The 4-cavity cassette mold for the demo…was chosen due to the particularly challenging specifications and tight tolerances of the parts. Tyler Adams Promoted to Vice President of Makuta, Inc.
Micro injection molder Makuta, Inc. of Shelbyville, Indiana, announced today that Tyler Adams has been promoted to Vice President of the company. In his new position, Adams will be responsible for management of the company’s micro molding operations and the associated departments that ensure the quality, overall productivity and on-time delivery of the company’s high-precision products. Executive Editor Matthew Naitove visited Makuta to develop the in-depth article covering the history, manufacturing technology, people and the advances the company has made in micro molding. 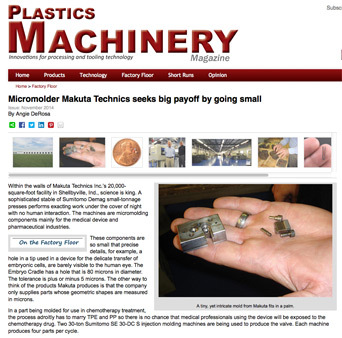 “A little more than 10 years ago, Makuta was able to mold parts with hole diameters of 80 µm, and that was considered small. Today, the firm produces parts with hole diameters as small as 20 µm and many of its molds are built to hold tolerances of ± 5 µm,” writes Naitove. An exciting new medical micro-molding project from Eye Care and Cure, Inc. and Makuta, Inc. will be featured in Sumitomo (SHI) Demag’s NPE Booth (W623). 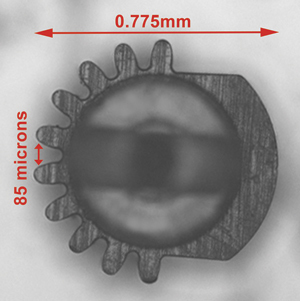 Makuta and Sumitomo Demag will mold a 0.524-gram POM gear that plays a vital role in a unique new cataract surgery device developed by Eye Care and Cure. NPE 2015 will take place March 23-27 in Orlando, FL. 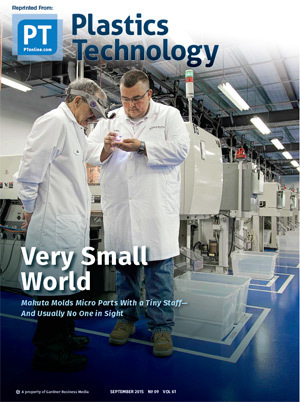 An article on plasticstoday.com on the micro-molding demonstration can be read here. 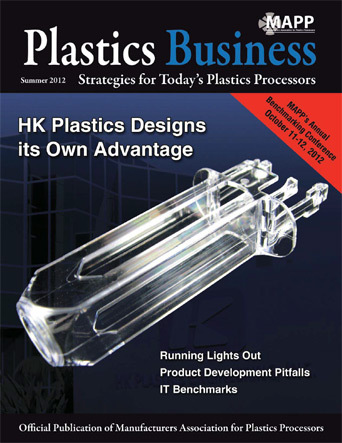 Makuta, Inc. was selected for the featured plastics processor in the first issue of the new Plastics Machinery Magazine. Angie DeRosa, Managing Editor of Plastics Machinery Magazine, toured the Makuta plant and met with employees in the preparation of the feature-length article. 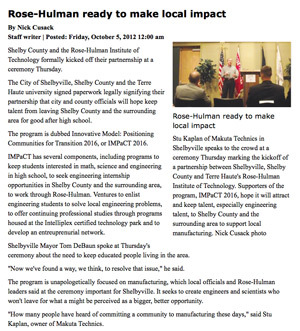 Stu Kaplan, president and owner of Makuta, Inc., a leader in the micro molding industry, lends his support to IMPaCT 2016, a program dedicated to attracting and keeping engineering and manufacturing talent to Shelby County, IN and the surrounding area to support local manufacturing. For full details, read the newspaper article. Running a plastics processing facility “lights out”, requires all the elements – people, technology and product – to be perfectly in sync. Micro molding veteran, Makuta, Inc. has successfully maintained that balance since 1996, molding millions of parts each month with a staff of 10 and only one manned shift. Stu Kaplan, president of Makuta, Inc., talks to Plastics Business Magazine about how to effectively implement a lights-out strategy. Plastics Technology Magazine discusses the benefits of the revolutionary new Sumitomo Demag T-Rex SL Screw Assembly that was demonstrated at the NPE2012 show in Orlando. The two-cavity mold used during the demonstration came from Makuta, Inc.. Stu Kaplan discusses the new screw and how it will benefit micro molding. Micro molding expert Stu Kaplan discusses “Hardware Developments for Machine and Robotic Transfer Systems in Micro Molding” at the 2012 MD&M East Conference in Philadelphia, PA.
For full details, read the full press release. Stu Kaplan, president and owner of Makuta, Inc., a leader in micro molding industry, participates in the “Leading Entrepreneurial Innovation: The Rebirth of Small Town Manufacturing Through Innovation” panel discussion. Injection Molding Magazine showcasing Makuta’s Shelbyville, IN facility. It isn’t often that a molding operation can be described as “without peer.” This is one of those rare times. A visit with Makuta, Inc., which has clearly perfected the science of micromolding, did not disappoint. 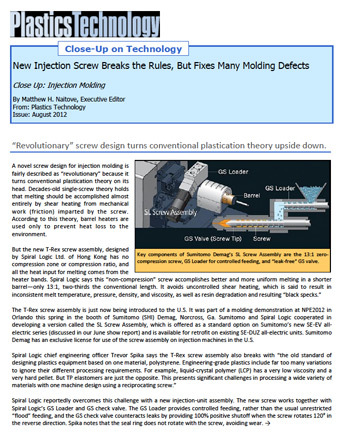 Read the article in Injection Molding Magazine.